In our last interview Emmanuelle Bekkers said that one of the reasons she made wine at Yangarra was the sorting table. Hiro Kusuda takes sorting to a new level, he berry sorts. A day’s hand picking takes another 3 days to pick out the bad berries . I first came across Hiro’s wines at the Mornington Peninsula International Pinot celebration in 2015. His brother was there showing the wines. I thought they were very good. 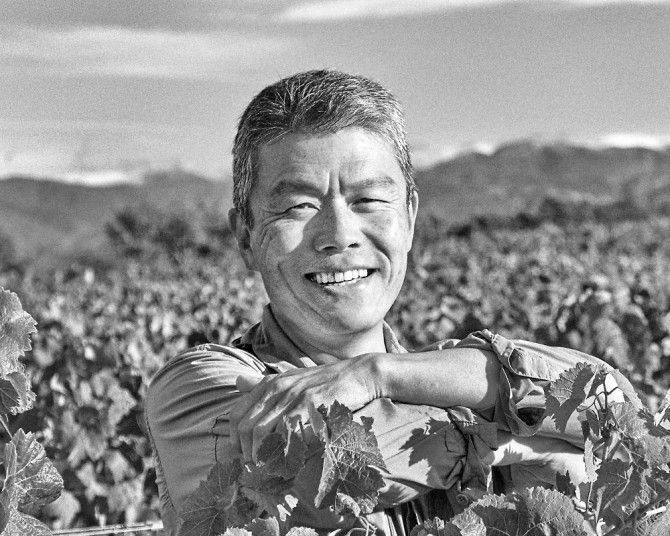 Jancis Robinson in her Financial Times column, introduced Hiro as a most extraordinary wine producer. 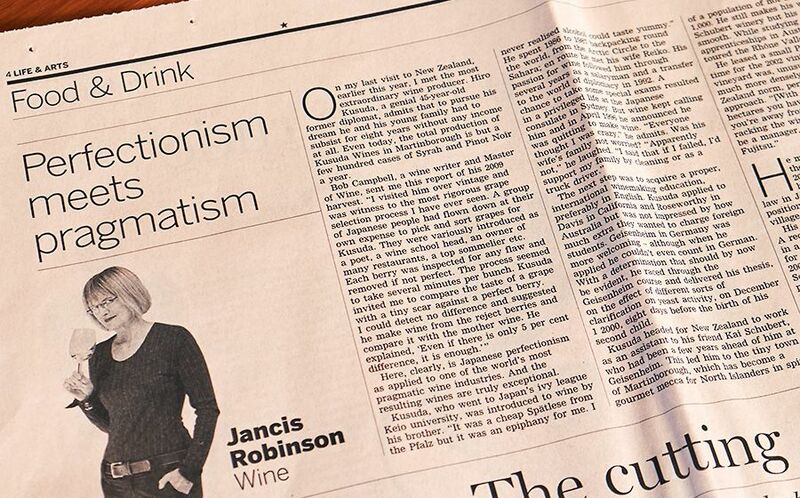 Jancis Robinson’s piece in Hiro in the Financial Times. 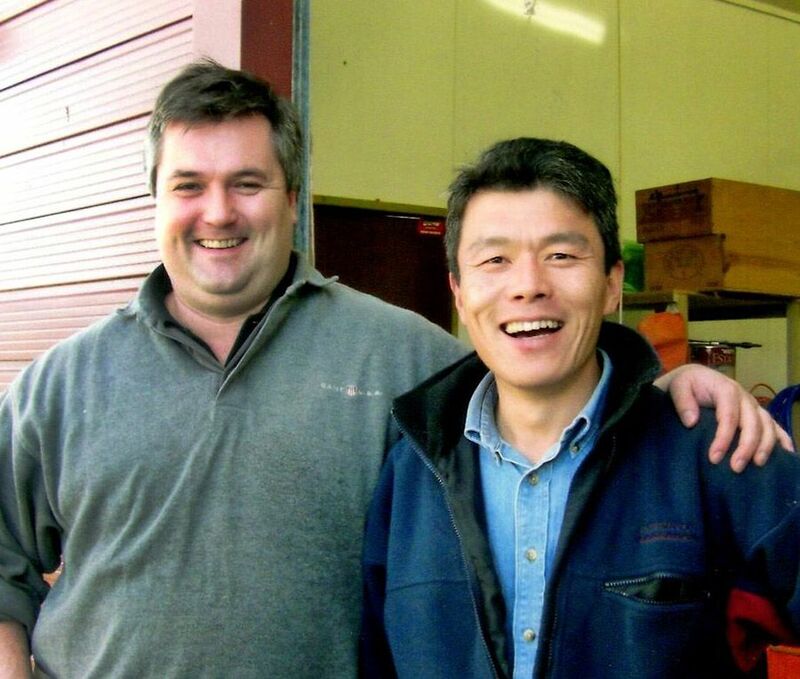 I was in Martinborough earlier this year and met up with Hiro, he is certainly a most extraordinary wine producer. You were a lawyer and then an International diplomat ; Who introduced you to wine ? I studied law, but in Japan even if you go to university and finish your study you are not a lawyer… even the best ones need four to five years hard work and for the rest maybe ten years… sometimes you need fifteen years to become a lawyer. That’s why I didn’t pursue it. I was not a lawyer but I studied law and then I started work with Fujitsu. I wanted to be in an international business department and they assigned me to that section. I was in a section that was in charge of exporting hard disk drives (8 inch was the norm then!) to Europe. That was in the height of the so called bubble era in Japan, money everywhere, so I was the first to be sent on overseas business trips by the company. I was the only one in ten months – and I knew nothing… I went to France, Italy, Germany…. At that stage I only spoke Japanese and English…. 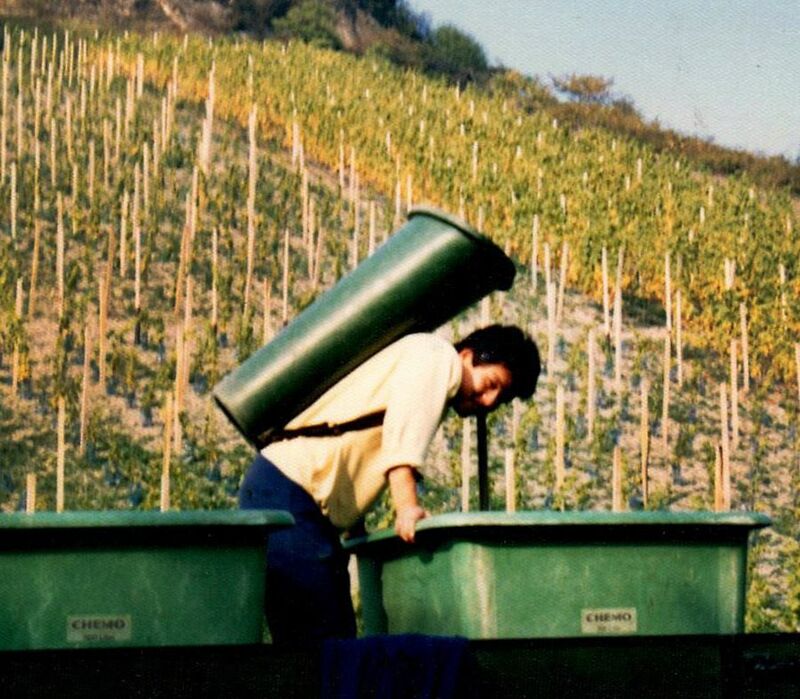 Hiro picking during the 1986 Germany Harvest. My interest in wine started with my older brother in Tokyo. Sake, you know the Japanese rice wine, was his main focus. He regularly had like minded people to his place and they would drink sake. I never thought alcohol tasted good, but one night he gave me a glass of white wine, German white. I sipped it and thought “Thats yummy – I never thought alcohol could taste so good.” That was my first encounter and that just drove my interest for this kind of wine… because beer and whisky, anything else I drank tasted horrible. That was in the early 80s in Japan, there were a couple of books about wine but not much you could use to learn about wine. I did want to learn, but of course I had no money and the wine was expensive. So I used to cycle around Tokyo and taste at all the department stores. If you went downstairs and were lucky, there would be a free tasting. So I decided to take one year off when I finished the 3rd year of my study and I backpacked through about 30 countries. My main theme was just to find out about and experience wine in Europe and then to go to the north of the arctic circle and also to the Sahara. I was lucky enough to meet a family in Rheingau, Germany, who owned a small winery and they welcomed me. They become my base and I did harvest there in 1986. They had a distant family member in London who was working for the company that were managing the assets of the Sultan of Brunei. He knew that I liked wine and so he took us to the wine shops Berry Brothers and Hicks and Don. 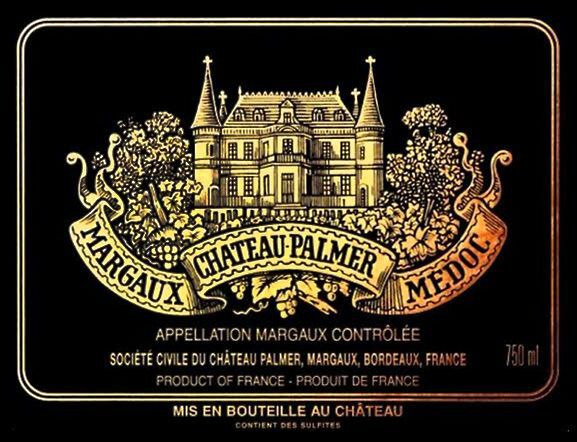 He was a master of wine and so through them he introduced me to Mr Sichel, who owned Margaux Chateau Palmer in Bordeaux. I did see a bit of wine – at that time the German wine was my favourite and I visited most of the famous estates there – especially in Mosel. But I decided to keep wine as my hobby, I never in my wildest dreams thought it could be my job. 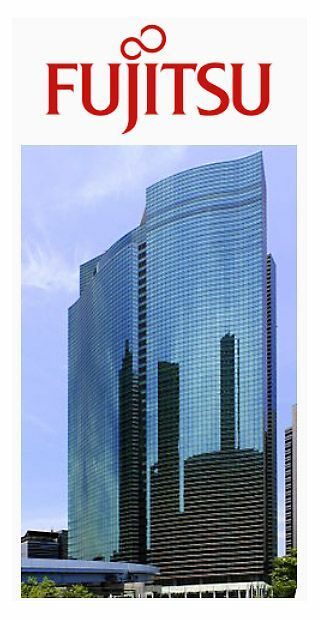 Fujitu’s world headquarters, the Shiodome City Centre, Tokyo. I came home finished my study and then went straight into working for Fujitsu. After 4 years I was getting bored….it was at that time, the biggest computer company in Japan. There were well over 200,000 employees world wide; 400 workers on one floor with no walls and islands of desks. You could see how you would move through the islands maybe five, ten, maybe twenty or thirty years before you would either go to a small company or move upstairs. I respect the Japanese culture; it has been developed over 20 – 30 centuries uninterrupted, so its unique. Thanks to that system the country is still there but some of the aspects…. I just couldn’t bear. I had tasted something different on my travels when I was younger and I thought I wanted to be abroad again before I set what I wanted to do in my life. My wife had a friend who worked for the minister for foreign affairs. They had a system of employing younger people to be assigned to the embassies and consulates to help with day to day operations. She was also working for a big company and not enjoying it, so she was preparing for the exam to get a post from the ministry for foreign affairs. I tried to go to Fujitsu Germany as an internal trainee but it didn’t materialise; I would have had to wait another 5 or 6 years to become a middle manager and then to be sent overseas. So after 4 years at Fujitsu I took the foreign affairs exam with my wife. She failed but I got through and was assigned to Sydney. 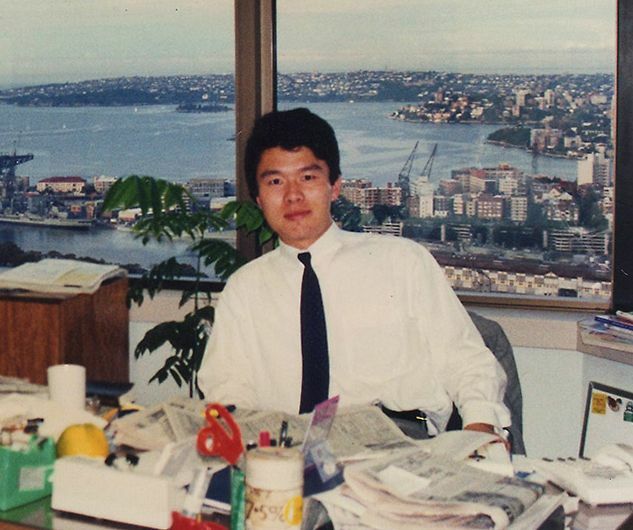 Hiro at his desk in 1993 in the Japanese Sydney Consulate. I was kind of a half diplomat, the title was administrative officer with an official passport. The Sydney consulate was quite large, one of the largest in the world, it had a staff of 40 – 50 people. We enjoyed living in Sydney – it was really a wonderful place to live. With your interest in European wine – Did you get an interest in Australian wine ? I have a wine atlas from James Halliday…and later on I did a vintage in Nicholson river East Gippsland. 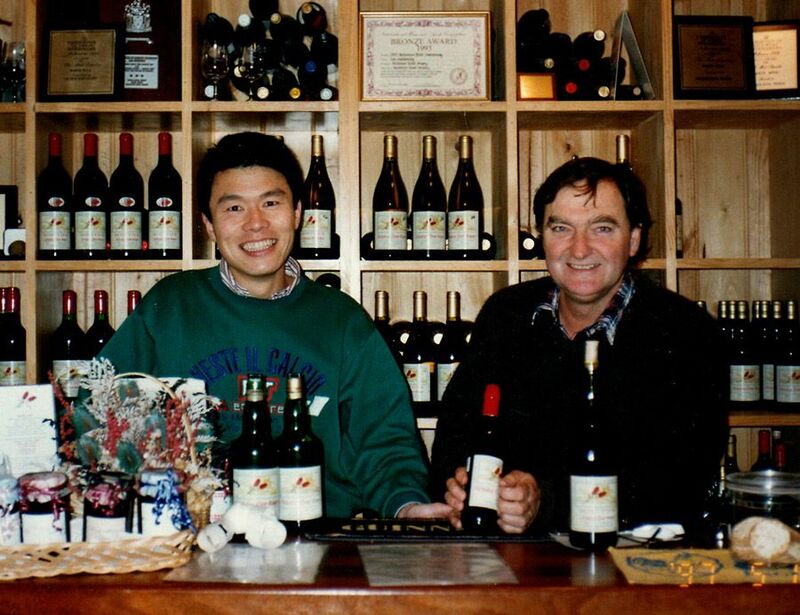 Nicholson River Wines, 1997 with Ken Eckersley. That was 20 years ago in 1997, before I started at the Geisenheim, because you had to have one year of industry experience before you started there. I did another vintage in Germany in 96 as well, with my friend who I had met in 1986. Can you tell me a bit about your study…. 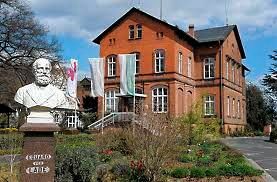 The minimum course at Geisenheim was 7 semesters; that was three and a half years plus one year practicum. I funded that from my savings, from work with Fujitsu and in the consulate. Towards the end of my time at the consulate I had an offer to join the ministry but I declined. I decided to chuck everything in. I had to learn German first, before going to Geisenheim. I started 6 months to a year before I quit the consulate, doing an evening course at Goethe Institute Sydney, of course I had to learn my third language with my second language. I was accepted into the Geisenheim course, I had no plan really – I just wanted to see how far I could go. I was 33 when I started and just about all of the people there were about 20 years old. Geisenheim was the best university in Germany for oenology and there were all of these young German people and no Asians…..you can imagine how it was. I was not there to make friends so I didn’t care. I was always in the front row – just in front of the professor every time….but then a couple of people who were genuine started to communicate with me. I was lucky, there was a kiwi guy who was the second oldest but still about 6 years younger than me and we became good friends. That was great because I could speak English and he was also a foreigner so we could understand each other. Then I got to know a couple more really nice German people. 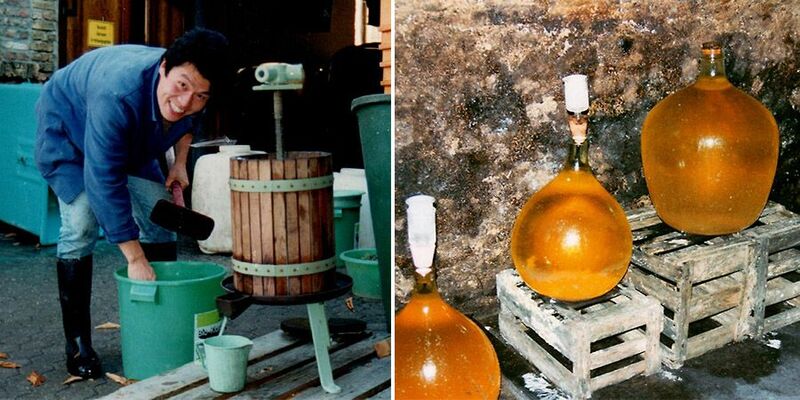 Hiro making his Germany Riesling in 1998. I wanted to do the diploma by thesis. I wanted to choose the right one, not something quick and easy just to get the degree. With the language disadvantage I knew I needed to start early. All my peers put aside three months or so to do the thesis; in my case I thought about a year. Then one day at the microbiology class, the professor just walked in and said ‘If you are interested in a suggestion for a thesis, come to my room after” I raised my hand, he chose me and it was a big thesis, sponsored by two companies one Swiss and one German. 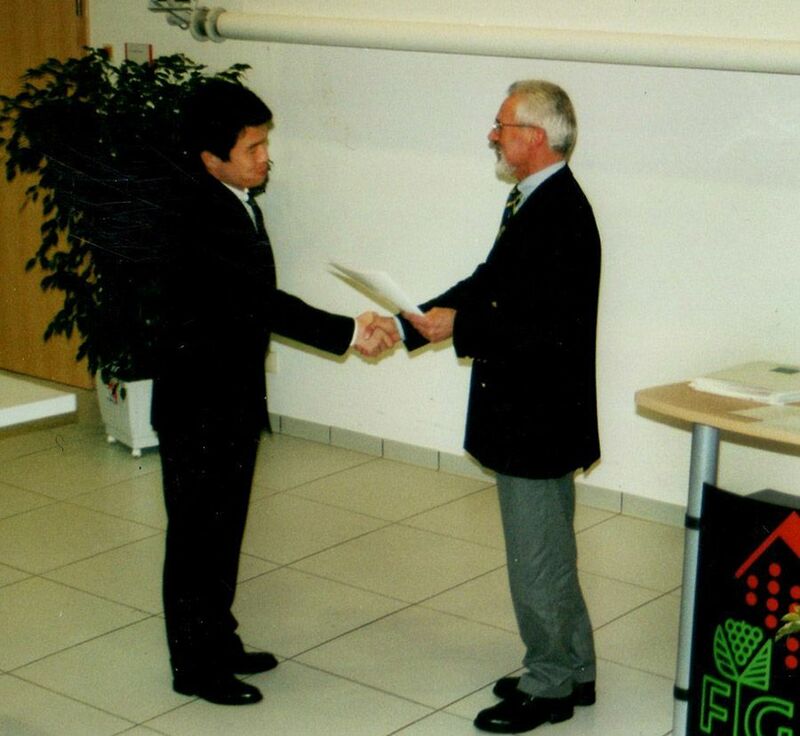 Hiro graduates from Geisenheim in 2001. It was on the influence of juice clarification on fermentation. Before you ferment wine, you clear the juice. Using the very new enzymes and the major traditional clarification agents, I analysed all the parameters, with special focus on amino acids – before fermentation and after. Then we analysed everything, and we could see how the yeast reacted to the different environment especially amino acids, and then sensory taste and everything. The initial plan was to air freight chardonnay grapes from South Africa. They wanted to look at the result before the harvest in the northern hemisphere. Then they realised that to transport grapes biologically intact is very expensive, so they decided to send me to the southern hemisphere to do the experiments. 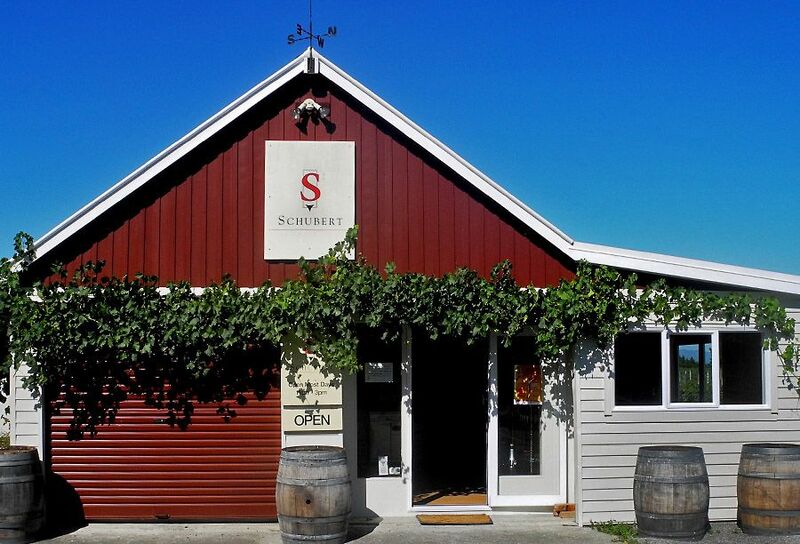 They couldn’t find a host winery in South Africa so they ended up in Martinborough, New Zealand, with Schubert Wines. Kai Schubert knew the guy who was responsible for my thesis in the sponsoring company. I was in NZ for about a month and then went back to Germany. Every day I analysed the data and searched references and it was then that I felt all the subjects that I had learnt previously, just connecting and coming into line; from soil to plant to fermentation. Before that I wasn’t confident … I thought I’d have to go back to Japan and work for a company like Suntory. As I was getting to the end of my study I started to think about what next. I didn’t want to stay in Europe because if you want to challenge then – I have a very rude example … if I have a patron billionaire maybe Japanese….and he might say “Mr Kusuda if you want to make a great pinot noir, I can buy a parcel of Musigny and you make wine there” and then I go there and make wine. 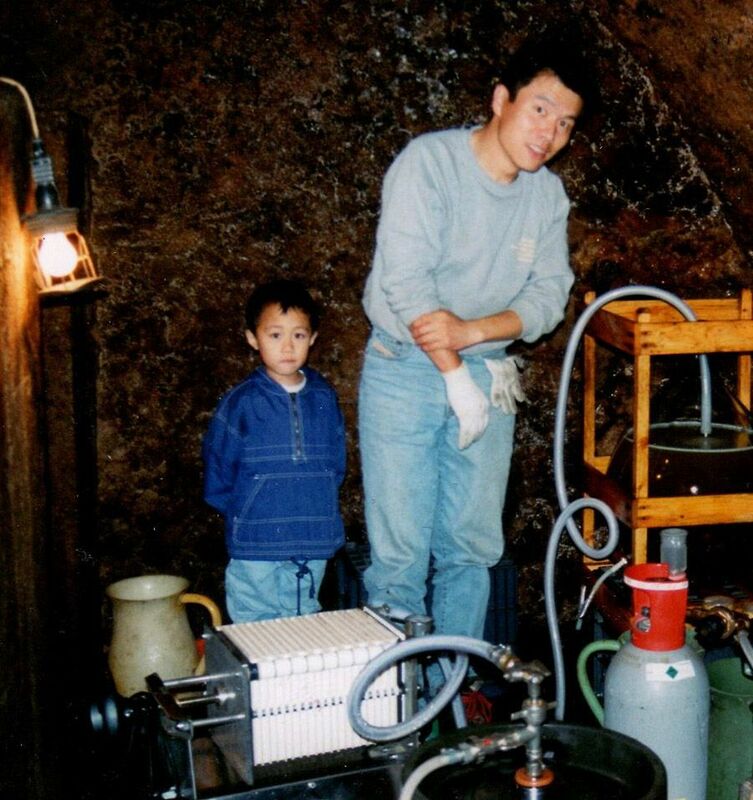 Hiro and his young son Ken making their own Germany Riesling in 1998. I think that’s very difficult and maybe if I make great wine then the other people may say “Musigny is Musigny – a Japanese came on top of what the local people were building for the last 5-600 years or longer maybe just with cash in hand thats it” I can’t argue and they would have the right to say that…. It is better that I come to Australia or New Zealand, a very new place and start something, even if it’s not new from scratch. Then if that wine is recognised as world standard then that proves that even someone from East Asia with a background that has nothing to do with wine can understand from sun, rain, soil, plants, micro organisms, time involved in aging, into the bottle, into the glass, that’s the proof I can understand. I thought about asking Kai Schubert to write a false letter just to get a visa because if you get a job offer, it is easier to get a visa. But before I asked him he came home to Germany and visited me in Geisenheim. 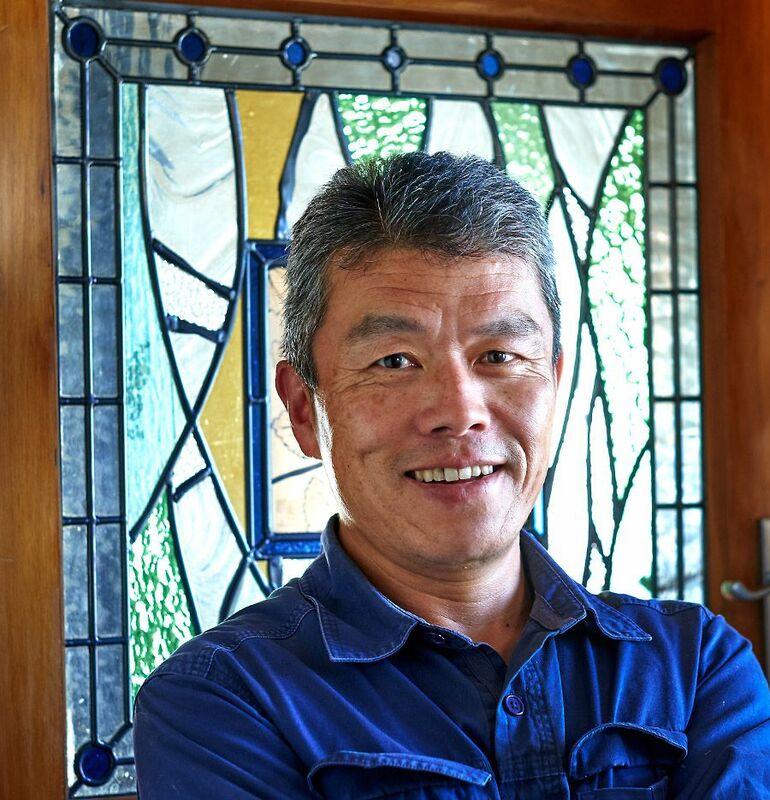 We were having a glass of Riesling and even before the second glass he said, “Well Hiro, you want to make wine in New Zealand – just come over – we’ll help each other… why not”. We shook hands and then our second baby was about to be born and I had to prepare this thesis. Hiro with his good friend Kai Schubert in 2007. Toward the due date of my second child, I said to my wife, “Please go to the doctor for a regular check up by yourself…” she had to do it all by herself in Germany, look after our young son and get ready for the birth of our daughter… It was very hard for her. 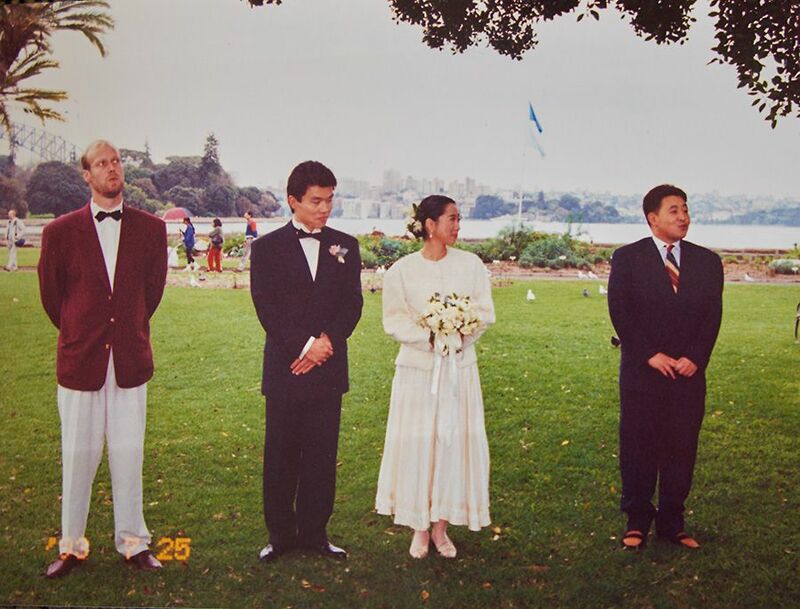 Hiro and Reiko’s wedding day in Sydney. Best man was Hiro’s friend from Germany Arne Pusinelli. The first of December was the deadline to submit the thesis, the due date for my daughter was the 15th of December and I still had the January graduation exams to study for – so this was the most hectic time for us. My daughter was born on 9th of December and then I passed my exams at the end of January. So then you came out here to New Zealand with two young children….How did you make that happen ? As I planned, I had used up my funds for the study at Geisenheim. So I asked my family, friends, and their friends for some money to start up. I said …. It was a very early form of crowd funding in 2000, I guess. 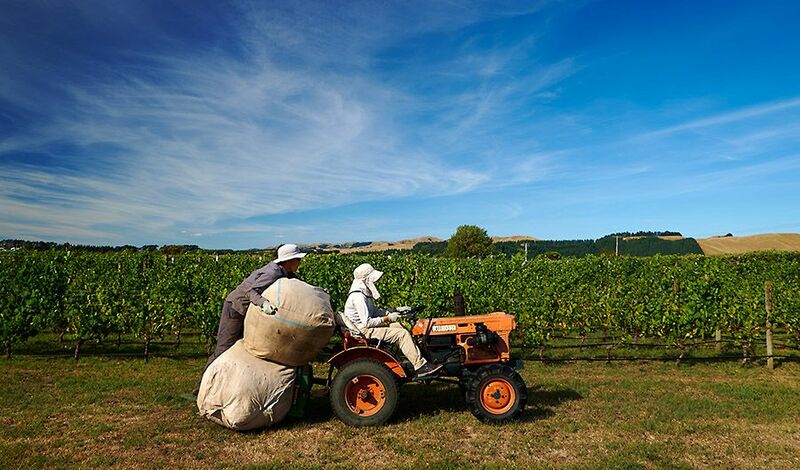 I was lucky because at that time the New Zealand wine industry was in its crazy uproarious period. I’ve got maybe 40 people who invested, a bit more than half a million dollars. In my head they are shareholders – but they still haven’t been paid a dividend yet ; some important investors got wine maybe twice. 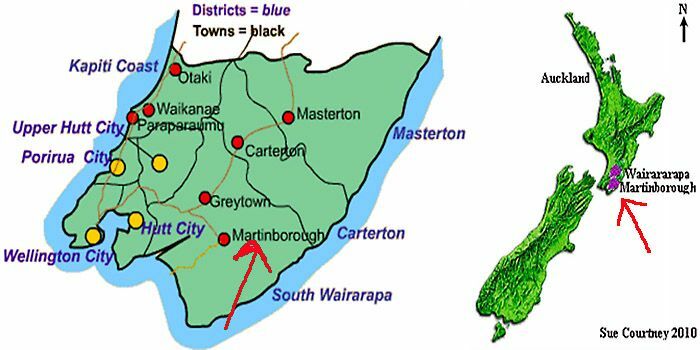 When I was in Sydney – James Halliday was also recommending Ata Rangi …then in Germany my professor said “Well Mr Kusuda you have to travel to New Zealand” but of course he didn’t know the name Martinborough. There were kind of shivers in my spine then – I didn’t expect that I would be going to Martinborough to do my thesis, but of course Schubert is my biggest collaborator – without Kai Schubert I would not be here. But also Clive Paton and Helen Masters at Ata Rangi are very supportive. Do you get back to Japan very often ? Yes because my mother, is living alone just out of Tokyo and my brother is in Osaka. 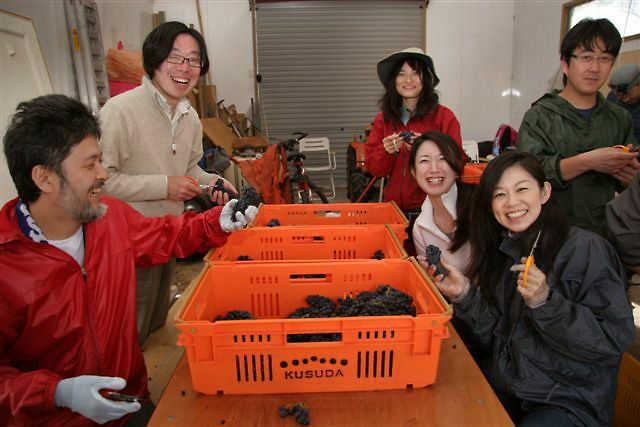 When you go back to Japan have you noticed the wine culture has changed at all ? It’s changed a lot, Japan is the second or third biggest importer of fine burgundy and prestige champagne – so especially with niche wine Japan is one of the biggest markets in the world. Its also probably one of the biggest markets for the organic, biodynamic or natural wine. The first world biodynamic conference was held in Tokyo I think – I went there and everybody was there. Somebody told me a group of your friends come down from Japan every year – are they the shareholders ? Hiro’s brother Takuya second from the left with his students from Academie du Vin Japan, two CAs of Japan Airlines, a sommelier, a composer and a restaurant chain owner. Takuya has been very instrumental in the project. Not all : there are about thirty, could be up to fifty, they come at vintage; they pay for their flight and accommodation and I provide all the wines. I usually stock about 1000 bottles here and over the harvest they would probably drink 300. That’s an experience they are not going to get in Japan and they become the best possible ambassadors for my wine. Some come just for three days, some a month, it sort of depends. You put a lot of time in sorting the fruit …. We pick whole bunches and then we pick bad berries out of each bunch and then bunch crush, then we destem the sorted bunches, often leaving a part as whole bunch.…. the white is different I’m talking just about the red. Berry sorting during the 2015 vintage. When we harvest, we do a bit of sorting and then put the bunches in baskets and then put the baskets in a refrigerated container. Let’s say picking 1 ton takes ten people maybe 1 day and then for the next three days we sort it. We sort by hand because if you use a sorting table, those berries get wet because some berries would be crushed due to the force for the bunch movement. The machine sorting table is very good to spot the really bad ones, but it is very difficult to see minor injuries on the table. 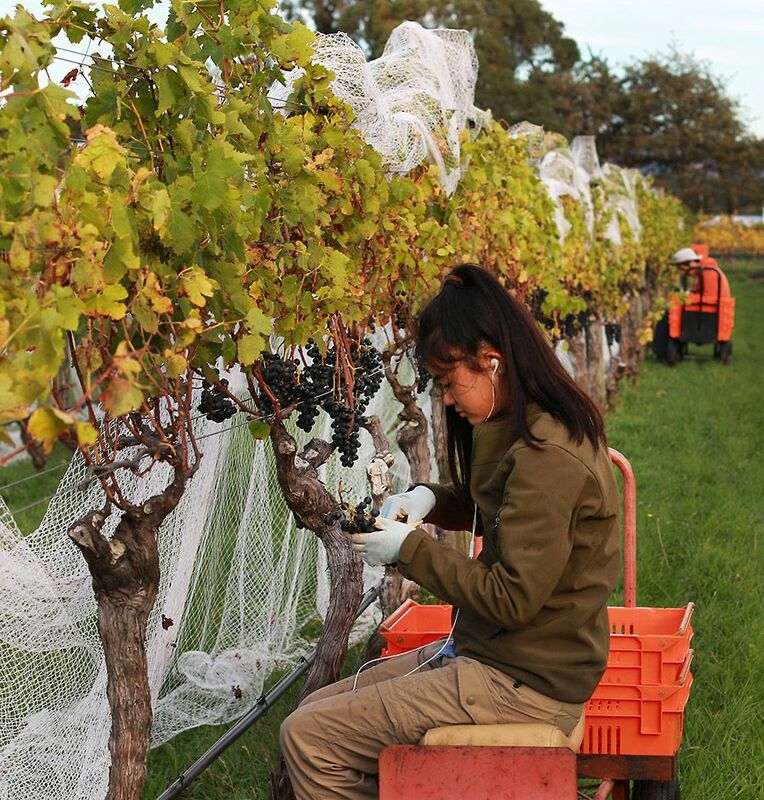 Daughter Yuria harvesting Syrah during the 2015 vintage. If you just pick from the bunches when they are dry you can see everything and you can take individual berries out. Of course, doing it this way, I probably lose some freshness even if it is 2 degrees and a bit of chemical reaction in the berry. I don’t know if it is positive or negative, probably both, but I still think there are positives in taking imperfect individual berries out, even if 100% removal is not achieved. It’s a very windy area especially here and the bunches are sort of rubbing on each other, or on wires and that leaves a scar on the skin. I usually try to do our best to get rid of berries with a scar – to me that is an injury of the grape. When a grape is injured the vine would produce defence substances based on the polyphenoles and those substances would be different to the ones we find in the healthy berries. Do they taste different ? I thought maybe not but those chemical substances made by plants could be quite powerful. Not unlike the ones produced by fungus.…they are lethal in their minuscular concentration. I personally think that it is a self defence mechanism for the plant. I also think that if it can attack something then the substance or flavour or similar could be multiplied by the fermentation. You treat the white wine differently ? I don’t think it is positive to leave white grapes for four days, so it is usually pick then press. We do our best to pick the clean ones only but the intensity of sorting for my white is not so particular – its just not possible. So what is it about pinot and this area that encouraged you to come down …. Pinot is my favourite and also reputedly the most difficult and the most expensive wine in the world. What I have done is for many stupid but if you set yourself a challenge you should go for the most difficult. How did that progress to Riesling and Syrah ? The reason why I came down here is Pinot Noir because I knew the potential was very high : outside of Burgundy maybe the best. 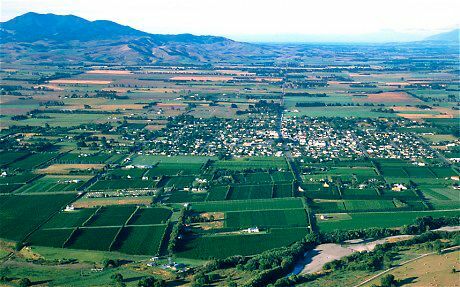 Martinborough just east of Wellington in the new Zealand North island. I had a look at Central Otago, Nelson, the Waipara and then I decided to stay here. I was lucky enough to lease a vineyard soon after I arrived here. I was lucky because the owner was a very francophile person and so the plant density and the design of the vineyard was very French….so no one wanted to work there. It had very low, close planting, no irrigation – that’s why nobody wanted it so they contacted me …it was good fruit. I only had it for two years because the owner passed away soon after and the son came in and the dynamics changed. Two years later, I got the chance through Murdoch James – they had a big chunk of vineyard close to the town centre which they put on the market. It was a very good location, closest to the town square but the asking price was too high. Nobody wanted it and it remained unsold for more than a year so they decided to subdivide. The agent contacted me and I decided to purchase the corner section; one hectare Syrah only. The first vineyard that I leased had a small parcel of Syrah … and I had no idea about Syrah. Of course when I toured Europe I went to Rhone and visited many famous wineries like Chave, Guigal, Chapoutier etc. I was a student and asked a lot of questions about oenological process but I never dreamt that I would touch a Syrah grape so all the answers went straight out and there was nothing left in my head. It’s only in the last 5 – 6 years, that I am starting to understand the climate of Martinborough – at that time I just thought… Martinborough is for Pinot Noir…. too cool for Syrah. I spent most of my time with Pinot then if I had time a bit with Cabernet Merlot. So Syrah was neglected in the vineyard but now apart from the Rhone , Northern Rhone ? New Zealand Syrah could be the second best and many big international media people are agreeing. The most surprising wine I made in my first vintage was actually Syrah. The first of my wines reviewed by important international critics was actually that Syrah. That review was by Bob Campbell in 2005, it was my first one, 2002. He had written an article about Syrah in the Air New Zealand inflight magazine and the top of the list was mine. No staff, just crowd funding. I had no income for 8 years after I quit the Ministry for Foreign affairs – living for four years from savings so we only used money for something absolutely necessary. My brother in law was one of the main sponsors, he works for one of those big PR companies; if I asked him he would raise millions. I could do that sort of business probably without a problem, but that’s something I don’t want to do. I’m not doing this wine for the numbers. I’m not saying I don’t want money but it is not for numbers. From time to time when they rate my wine better than the usual… that is good …. yes, I like that. What interests you in wine ? The human factor in the taste of wine. That is my interest now. I had a lunch with Jancis Robinson last September in London and tried my best to explain where I’m at. I am now 51 and probably only have about 10 – 15 vintages left because the type of operation I have chosen is quite demanding physically; I do most of the jobs myself. My body is still coping , but I don’t know for how long…. My background is one of being born and bred in Japan. I travelled a lot when I was younger and had the chance to live with a family who had winemaking history of over a century, then doing a vintage in Australia, then study in Europe and coming to such a new place in New Zealand. So I sort of arrived at wine along my life’s journey. 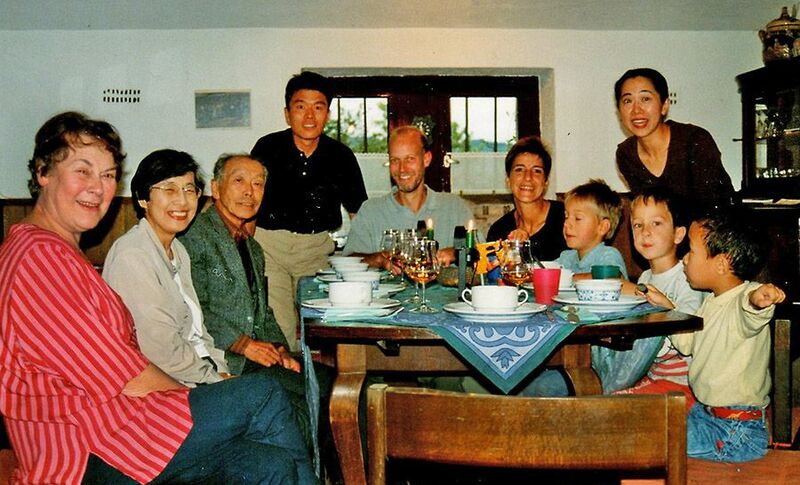 Families Pusinelli and Kusuda in 1999. If the liquid in the bottle is not good enough that’s it, no frills. I’m not saying I don’t do marketing but I only do the bare minimum. I just put my energy into the wine and then see how it works. No signs, no brochures, no media releases, no social media…. Where do you sell your wine ? Half of my wine goes to Japan then about 20 percent to UK – Berry Brothers they do private sales and then Hallowed Ground run by Amelia Jukes, Matthew Jukes wife. 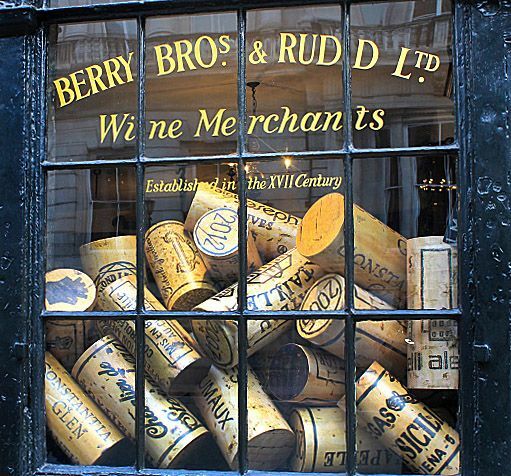 Berry Bros & Rudd Ltd : London. 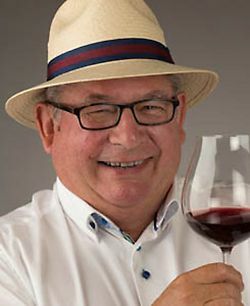 My pinot costs maybe 80 -90 pounds in London – no trouble – so good and this one (the syrah) would be 60 – 70 pounds – I could probably raise my price, especially in New Zealand but I have to be careful. I sell a small amount to Australia through Prince and Bootlegger – a father and son production. It looks like they have moved Kusuda to Cru Wines, where they sell Champagne Salon. My riesling is probably nudging up to $40 a bottle in New Zealand and around $50 in Australia. At that price you are probably seeing very good Mosel coming in. I find personally if I have Syrah and Pinot Noir and Riesling then nothing else .. I just don’t want to violate what has been built in centuries ….even if I do the blind tasting and my wine tastes better than a bottle of $300 burgundy, I don’t think it is right to put the same price tag. I have to be careful but then again I just purchased the pinot vineyard that I have been leasing in the last 4 years. 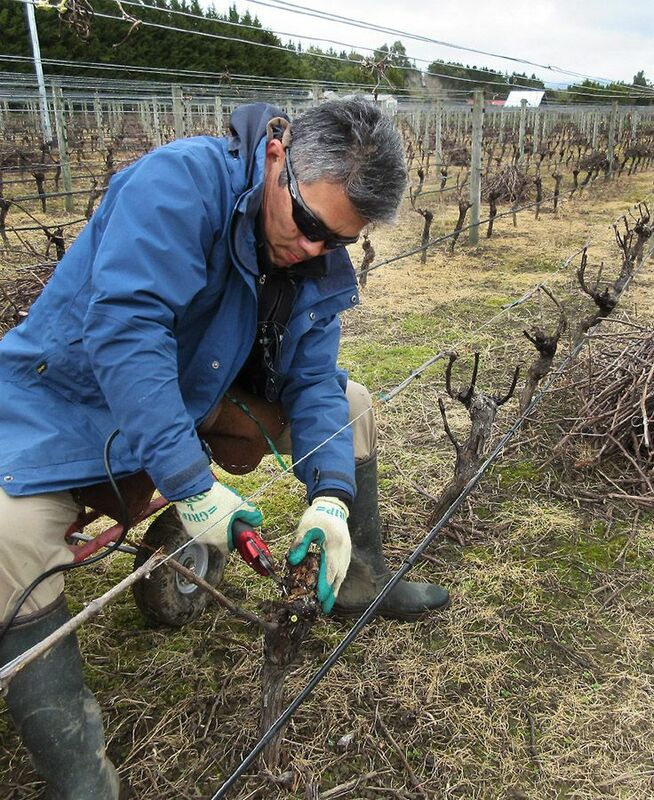 Hiro pruning the Pinot Block. I really struggled because that was a lot higher than I thought… but I think high density really gives something and vineyard has very close planting 2.5 hectare – under vines probably 1.6 with the majority planted 1.5 metres by 900; more than 7000 per hectare, one of the highest in New Zealand. 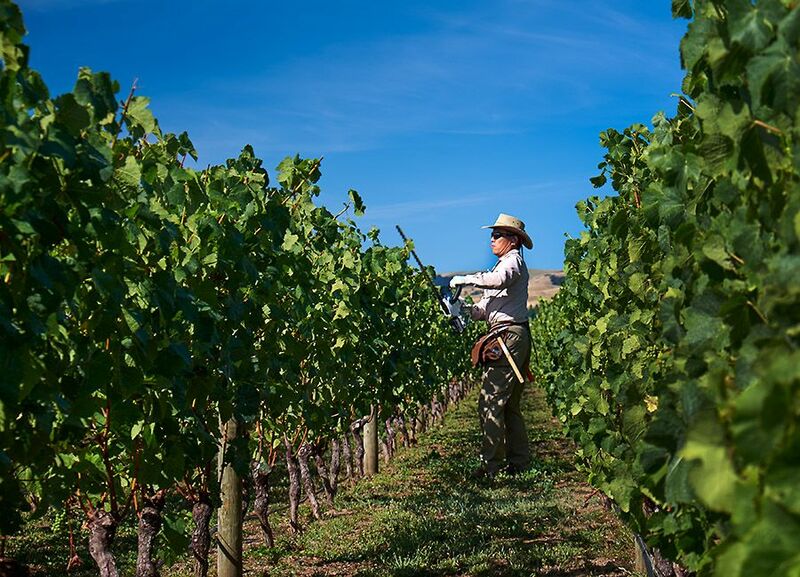 You’ve been sourcing fruit from that block from 2012 vintage, will that enable you to increase your volume ? Probably not … I could plant a bit more – but that means more work and I don’t want to employ people….I want to keep the use of contractors to a minimum. I still want to build my winery because I can make better wine with my own facility. 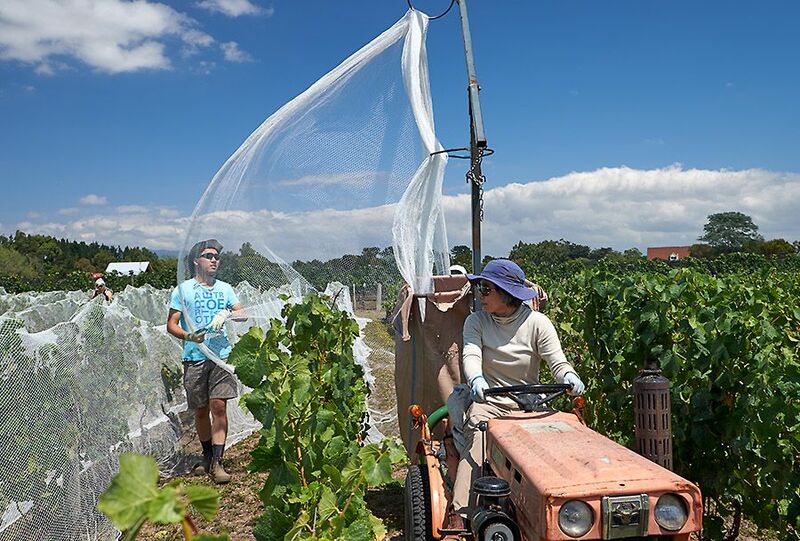 Last year I made only 200 cases of pinot…..to make just a shed with good insulation and a good sewage system would cost maybe half a million dollars. To justify that amount of investment with a only a couple hundred cases of wine – not simple maths… but I do my best. In an average year I would produce 500 cases Pinot, 300 cases Syrah and 400 cases Riesling. 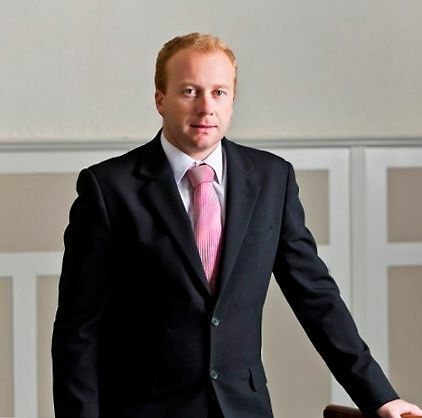 Grossi restaurant sommelier Mark Portheroe. Pinot, Riesling or Syrah ? Mark Portheroe, from Grossi restaurant from Melbourne, one of the best sommeliers in Australia, he was the guest judge for the Air New Zealand wine show. “It’s the best sweet riesling outside Germany – best ever” ….I was very happy. So if you have had no plans up until now – have you got any plans for the next 15 years? Just hopefully build my own winery and make better wine… and hopefully if I decide to retire if I could smile and think I did my best shot as a wine maker – that would be nice. Do you think if you retire you will stay here or go to Japan…or go to Germany ? But I am talking to my children and they must find something else. I found wine by myself and I decided to go for it and they have to find something for themselves. My daughter shows a bit of interest – but my son…he refuses to drink alcohol, that’s normal that the son does not want to be like the father – that’s totally fine. When I retire I don’t know maybe I’ll go back to Japan maybe to Australia. I like Australia but some people’s attitudes……but also Japan – maybe the society may be too tight. Not much … maybe rugby… I played rugby in Japan so that was really handy when I got here, because I could name the most of players of the Hurricanes or Wellington Lions if asked. Hiro’s Japanese rugby club in 1985. When I have time in the night when I am alone… I watch rugby. I loved travelling but now, living in NZ and pursuing winemaking, every day is like travelling. 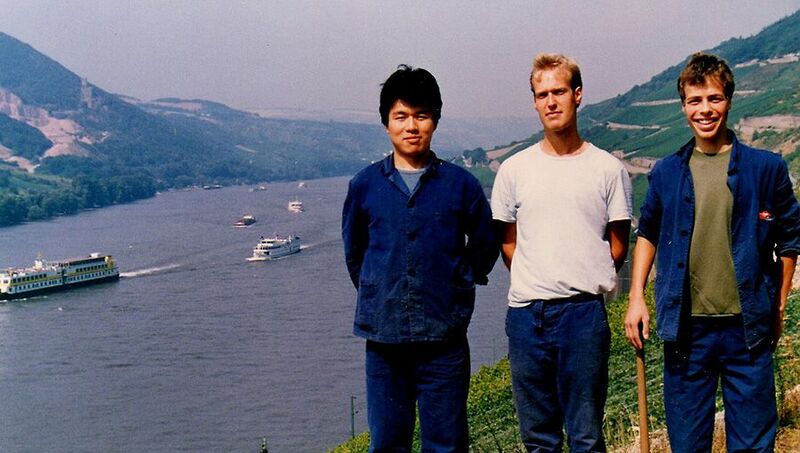 Summer 1986 in Germany with the Pusinelli Brothers, Arne and Joern.